"How much longer can the China construction boom last?" After almost 10 years living abroad, former strategy consultant and GreenRigCo co-founder Lindsay David returns to his native Australia. 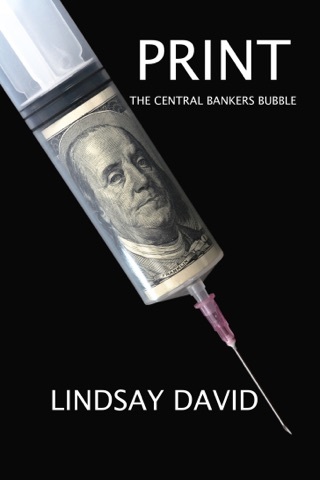 His years of macroeconomic research suggests that Australia is in the midst of one of the biggest credit and property bubbles in modern Western history—bubbles that are supported by the largest credit bubble in human history, the one that has been brewing in China. Australia: Boom to Bust dives deeply into the plausible collapse of the “Three Pillars” of the Australian economy: Banks, Natural Resources and Real Estate. 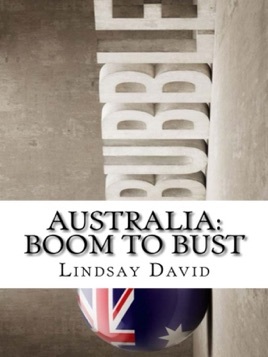 Lindsay David provides unique commentary on the true state of the Australian economy and identifies major defects in the structures of the Three Pillars. Toxic levels of private sector debt sponsored by Australia's largest banks has managed to flood already-inflated asset classes of the Pillars on the back of a once-in-a-lifetime construction boom and property bubble in China. Compelling data and research suggests that the Australian economy has lost touch with reality and has gambled away its banking system to propel the mining and property markets into unchartered waters. Powerful Australian property and banking pundits have successfully led Australians to believe that the unusually high cost of real estate is justified. The pundits tell us that Australia is simply “different.” Pundits love to use the word “boom,” but they rarely use the word “bust.” When a country as a whole and its cities lack density alongside a median house price that is more than six times the median household income, there is only one word that can describe the true state of the Australian property sector—bubble. The domestic banking sector in Australia learned absolutely nothing from past economic downturns in Japan, America, Spain and Ireland. Unfortunately, it will suffer the same sad fate that its northern-hemisphere peers did, as history has a good track record of repeating itself. The warnings signs of a toxic Australian credit bubble could not be any clearer—they have simply been ignored.